Stuart Maconie just announced on BBC 6music that Difford and Tilbrook will be touring together again and that there’ll be a full tour in November 2014. Full details to come soon:) They’ll be appearing on his show on Thursday to discuss their career. I’m looking forward to it! Who’s with me? The announcement on 6Music today was for Glenn and Chris’s first duo tour in nearly 20 years. They are touring their new and never seen before show ‘The At Odd’s Couple Tour’ this November in the UK. They will be on the Radcliffe and Maconie show on Thursday this week at 1.30pm to talk about the show. 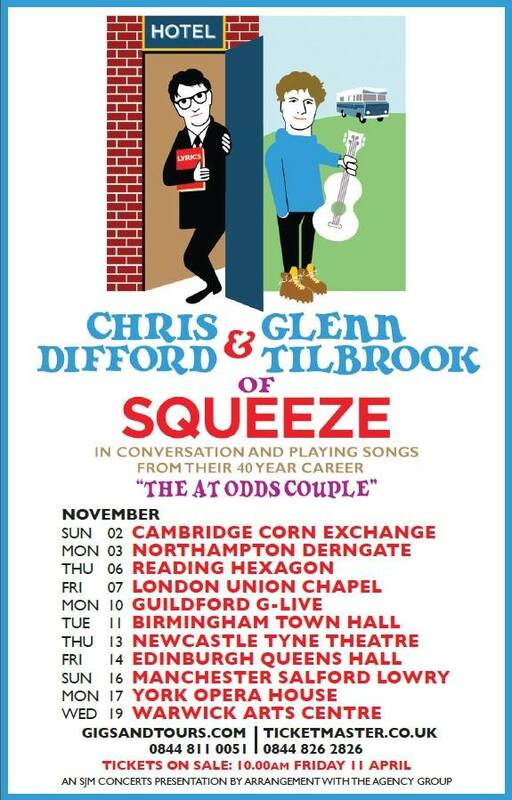 4 Responses to "Difford and Tilbrook “At Odds Couple” tour in November"
Great to see them coming to York. Can’t wait! Sounds fabulous, but you know my question, David. Are they coming to the U.S. this summer?